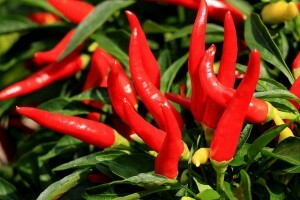 e: 18pt;">Cayenne pepper, one of the most popular spices, may have multiple fat loss bio-activities. ne peppers, also known as red or chili peppers, are harvested from the Capsicum annuum species of flowering plants native to the Americas. Cayenne is used mainly for cooking spicy dishes, either in its whole pepper form or as a powdered spice, and is especially popular in Asian and Latin American cuisine. The main active ingredient of cayenne peppers is capsaicin – the compound which gives them their distinctly hot, burning taste. Capsaicin is used in creams to relieve joint and muscle pain, but has also been researched for many other medical uses, including weight loss. Capsaicin is believed to boost fat oxidation, specifically by making the body switch to using less carbohydrates and more fats to produce energy. As a result, more of the body’s fat reserves are used than normal. This effect explains why several studies reported subjects voluntarily choosing to eat food with less fat after capsaicin supplementation. research of capsaicin showed promising results, which explains why human trials were quick to follow. This study looked at the effects of capsaicin on lipid metabolism – the absorption and usage of fat by the body. The rats supplemented with capsaicin were found to accumulate less fat and have lower blood triglyceride levels. Triglycerides are the primary constituent of fat, and high levels are indicative of obesity and metabolic disorders. Capsaicin also resulted in higher lipoprotein lipase (LPL) activity – an enzyme used to digest and process dietary fat. aicin as a weight loss aid are mostly positive, showing mild benefits. This study was performed in two parts: in the first, 13 Japanese women were randomly selected to eat breakfast that was high-fat (HF), HF plus 10g cayenne pepper, high-carb (HC), or HC plus 10g pepper. The women then ate ad libitum at lunch – that is, as much as they wanted to feel satiated. Those who took cayenne reported reduced appetite, and ate fewer calories; in particular, their fat and protein intake was lowered. The HF plus pepper group ate 20 % less protein and 17% less fats at lunch than the normal HF group, while the HC plus pepper ate 6% less protein and 4% less fats. In the second part, 10 men were given an appetizer with and without 6g cayenne, and then ate ad libitum. The group given cayenne had decreased energy intake by 11% at lunch, and in particular ate 18% fewer carbs. This study looked at the effects of several natural compounds on food intake. Twenty-seven healthy-weight men and women were randomized to 3 weeks of negative and positive energy balance, during which they were supplemented with placebo, capsaicin, green tea, CH-19 sweet pepper, or capsaicin plus green tea. Energy balance is the basic equation that determines whether we gain or lose weight; a negative balance results in weight loss, while a positive one leads to weight gain. Capsaicin was found to reduce food intake, hunger, and the desire to eat in both negative and positive balance tests when compared to placebo. Expectedly, capsaicin had a stronger effect when paired with green tea, another natural compound known for its beneficial effects. The goal of this study was to see whether capsaicin could assist with weight management by limiting weight regain. Ninety-one overweight individuals first underwent a 4-week diet, and followed up with a weight maintenance period of 3 months. They were divided into placebo and capsaicin 135mg/day groups. While capsaicin was not found to improve bodyweight maintenance or affect hunger, it did improve fat oxidation – a measure of the body’s usage of fat for energy. The aim of this study was to evaluate the effects of smaller doses of cayenne pepper (CP) on food intake. Twenty-five men and women underwent 3 separate experiments in random order: 1g CP, preferred CP quantity (1.8g average for regular spicy food users, 0.3g for non-users), and placebo. CP increased energy expenditure and body temperature for all subjects. Only those who didn’t previously eat cayenne pepper had lowered food intake and appetite, which suggests that long-term consumption may cause desensitization. The most interesting finding, however, was that taking cayenne pepper resulted in greater energy expenditure, fat oxidation, and skin temperature when taken orally versus capsule form. This suggests that sensory exposure to cayenne exerts independent effects on thermogenesis and appetite, so taking it orally is ideal for maximum effect. This study looked at the effect of cayenne pepper on food intake when taken orally or via capsule on 12 healthy men and 12 women. They followed each of the 4 experimental conditions: placebo in tomato juice, cayenne pepper 0.9g in tomato juice, placebo capsules, and cayenne 0.9g capsules. All supplements were taken 30 minutes prior to a meal, for a total of 2 days. Taking pepper orally resulted in 16% lower caloric intake versus 10-12% for capsules, while both forms reduced the feeling of hunger. Furthermore, those who ingested pepper chose to eat more carbohydrate-rich foods and less fat-rich foods. This indicates that the body switches to using more fats rather than carbs for energy after capsaicin ingestion. m 0.5 g to as much as 10 g.
Typical cayenne dosage in retail supplement is in the range of 500 mg.
round powder that’s encapsulated for supplement delivery. This form is most affordable, but may have some tolerability issues. Cayenne liquid extract: Potent and fast-absorbing, but these liquids may be harsh on the palate and in the stomach. Standardized cayenne: Cayenne supplements are sometimes standardized to supply 0.2% to 0.3% capsaicin. Capsimax®: This premium, clinically studied cayenne form supplies capsaicin in controlled-release beadlets, which eliminates “stomach burning” sensations. Capsicool®: This branded form combines cayenne with ginger and glucomannan to promote better digestive comfort. Cayenne supports weight loss in many ways. It’s a longstanding culinary spice, so you’re not introducing anything weird into your body by taking it. The hardest part of cayenne supplementation appears to be tolerability, which is why we recommend Capsimax: It’s a premium-quality brand that has been widely researched in humans. Look for Capsimax in a complex. It may be a more cost-effective way to take this premium branded ingredient. Depending on your goals, you may find Capsimax in blends designed for general weight loss or for “cutting” phases in bodybuilders.